In the USA, FOG Remote Firing Systems are currently available to the US Military only. Next Generation Radio-controlled Initiation System with full two-way-communication FOG-FSG is a fully compatible family of sophisticated radio-controlled initiation systems comprising a new technology thus representing the next generation of advanced initiation for explosive charges, pyrotechnics or other equipment. The operation of the system is intuitive and requires only a few steps to prepare and fire. To fire the system, the security key must be in and two buttons have to be pressed at the same time. If the security key is out, the entire system immediately changes to the secure mode. 8 – Channel Transmitter: This transmitter is able to initiate up to eight (plus another 8 with double occupancy) separate channels/receivers. 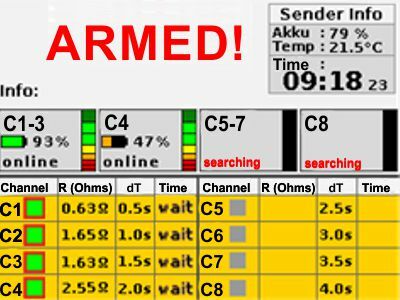 Initiations can be triggered individually or all together with a programmable time delay for each individual channel. 4 – Channel Transmitter: Same functionality as above, but with 4 (+4*) separate channels. 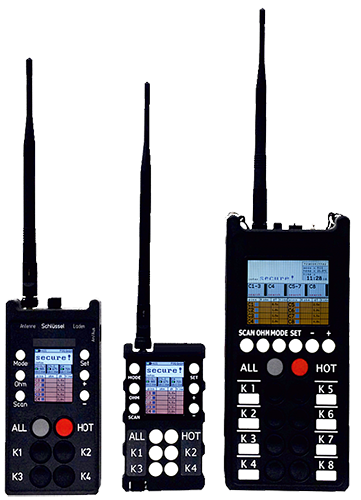 4 – Channel Transmitter Mini: This transmitter has been developed for Special Forces. 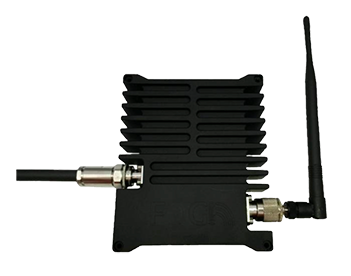 It is smaller and lighter than the regular 4 channel transmitter, but offers exactly the same functionality. All transmitters can be combined with all types of receivers and – also in mixed configurations. 1 – Channel Receiver (Class 4 dets optional): This receiver initiates a single detonator. It is characterized by its flat design, easy hand-ling and long battery life-time. 3 – Channel Receiver (Class 4 dets optional): It initiates up to three independent detonators. 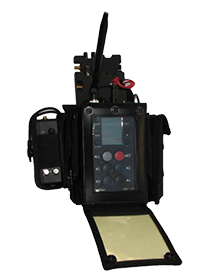 It is characterized by its compact de-sign, easy handling and long battery lifetime. 3 – Channel Receiver MINI (Class 4 dets opt. ): It initiates up to three independent detona-tors. 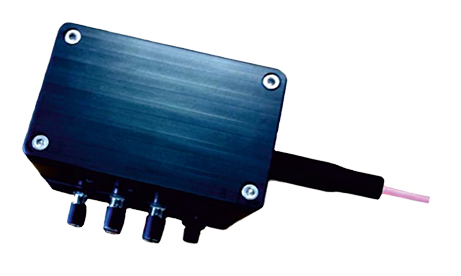 It is much more compact than the regular 3 – Channel Receiver and uses an external battery, which qualifies this actuator for hidden installations. Because of high efficient communication strategies and different energy saving mechanisms, the receivers can operate in standby up to 14 days without being recharged. 1 – Channel Receiver MICRO, disposable: This receiver has been designed for special operations. It is placed directly at the charge and is meant to be destroyed during the operation. Therefore, it is tiny but nevertheless provides the full answer-back functionality as the standard receivers. The disposable receiver features a battery compartment for COTS (commercial off-the-shelf) batteries and a short wire antenna. It is meant to initiate any detonator up to Class 4 (HU). The disposable receiver can also be used like a time programmable initiator – however with the ability to program or change the settings from a safe distance. 1-/ 2- / 3- Channel Receiver MINI, integration. These versions of the MINI receiver have been designed for integration purposes. They can be used to enhance the capability of small ROVs with additional – and approved – firing circuits for disruptors, weapons and explosive charges. Or they can be integrated into a stand or tripod. 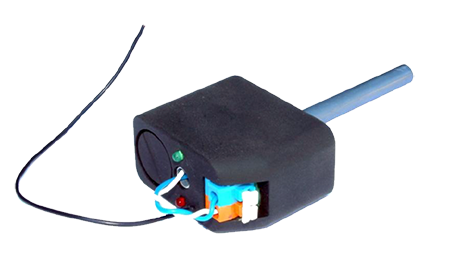 The receiver uses the power supply of the ROV (or tripod) and provides the same answer-back functionality as the standard receivers. Various parameters (e. g. input voltage) can be customized. The distance exceeds those of available ROVs. Shock-Tube Adapters are available as a 1-Channel Stand-alone variant or two click-on versions with either one or three channels to be fixed to the respective receivers. The adapters convert the firing circuit output into a 3,000 V discharge pulse for reliable Shock-Tube initiation. Easy removable Shock-Tube Heads accommodate the adapter to any type of Shock-Tube. Swimmer Unit: The Swimmer Unit is a buoy to house the Mini-Receiver at marine applications thus making the FOG-FSG a perfect tool for EOD-, demolition- or special operations on sea. The unit has a keel with stainless steel weight, hydrodynamic lift body, waterproof housing for the receiver and an antenna mount on top. 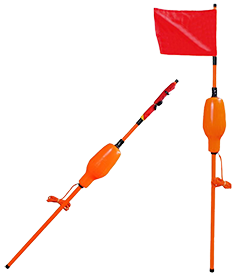 If required, it can be equipped with an orange flag and optional lighting for better visibility as well as with a 8 m floatable backup-rope. Due to its unique design and elevated antenna position of approx. 2m above sea-level it can be used even at heavier seas. Antennas Different antennas are available for different applications whereas the standard antenna is for general purpose, short antennas can be used for special operations and a deployed antenna may increase the distance in covered positions. 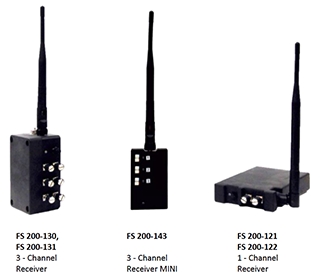 Antennas AN 100-100 AN 100-102 AN 100-108 AN 100-109 Extended Range As the Transmitter is usually carried and operated in close proximity to the user, the output power of the system is limited to a value which keeps the hazard for human beings at an acceptable level, however providing a reasonable distance to the target. If this distance is not sufficient to satisfy specific needs, the following two options can be chosen – individually or combined. Please provide your specific requirements, so that our specialists can arrange a customized configuration to suit your needs. 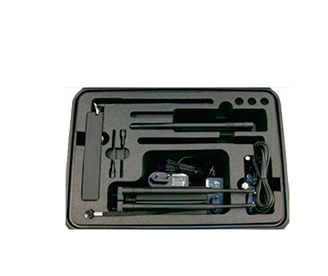 The Booster-Antenna increases the signal output power and operating range significantly using its own rechargeable battery. Depending on range requirements in can be used on one or both sides of the communication. Because of the high output power it is provided with an extension cable which allows a deployed position. One or multiple Repeater-Units can be placed between Transmitter and Receiver thus increasing the operating distance as well. Each Repeater-Unit is equipped with its own rechargeable battery. 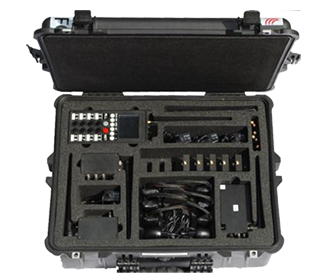 A variety of cases and pouches are available for transport and storage of your FOG-FSG remote initiation system and components. 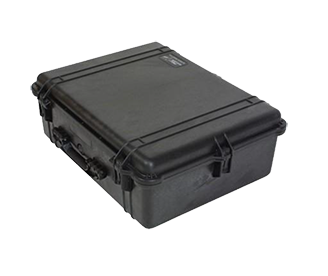 Constructed of durable and weather-resistant polypropylene with custom foam inserts the hard shell cases offer maximum protection for your system. The TTxxx Customized carrying pouch is constructed of Cordura and custom fitted to your transmitter unit. Errors, technical modification, design and pictures may be subject to change. Reproduction as well as electronic duplication with our written permission, only.